Older adults who have lost their ability to walk often rely on wheelchairs for their mobility. Adults who lack the physical strength to use manual wheelchairs are given powered wheelchairs, but only if they have the memory and judgment required to safely operate one. These necessary skills are often limited in adults who have cognitive impairments. As a result, cognitively impaired adults who are in need of powered wheelchairs are unable to obtain them and must rely on others for mobility. Independent mobility has been linked to quality of life and a decrease in mobility contributes to a decrease in quality of life . The ability to assist a cognitively impaired individual with navigation through the use of audio prompts. An anti-collision system to prevent injury to the user and bystanders. A shared control approach where the system will aid the user with navigation according to user’s preferences/intents. The ability to add-on to existing powered wheelchairs. Anti-collision protection is paramount when dealing with older adults. Studies have shown that a fall is the most probable outcome after being hit by a wheelchair. Falls for elderly individuals could have severe consequences such as hip fractures, which may even lead to death . To accomplish the navigation and anti-collision objectives a stereovision camera (Figure 1) is mounted on the wheelchair and is used as an input to the Intelligent Wheelchair System. Images from the camera are used to compute the distance of objects from the wheelchair. This distance reading is used to prevent objects from getting too close to the wheelchair, thus avoiding collisions (Figure 2). The distance reading is also translated to an occupancy grid (Figure 3), which is used by the system to determine the least obstructed routes around objects. A map of the environment is constructed and the wheelchair is localized using the Gmapping and VSLAM packages available in ROS (www.ros.org). A probabilistic user model (a partially observable Markov decision process) is used to determine the optimal strategy, based on the users’ level of independence and responsiveness. Wayfinding prompts are then issued to the user in order to help them navigate along the optimal route to desired locations, while avoiding obstacles along the way (Figure 4). A user study has been conducted with six cognitively-impaired older adults with dementia . Participants were required to navigate through a maze with foam obstacles to a pre-specified location. Participants completed two phases, one with the intelligent system activated, and the other with the system de-activated. Results showed that the system increased safety for all participants by lowering the number of frontal collisions. In addition, the wayfinding prompts assisted all users in navigating along the shortest route to the goal. Case studies focusing on quantitative and qualitative data for three participants are reported in . Recommendations for future development and testing of intelligent wheelchairs for cognitively-impaired older adults are provided in . Clinical trials with older adults with dementia to determine system efficacy and obtain user feedback for continued development and testing. Figure 1: Powered Wheelchair with Intelligent Wheelchair System (stereovision camera in blue). Figure 2: [Left] Distance readings, where brighter objects are closer to the wheelchair; [Right] Anti-collision system detects a close object (Click on image to enlarge). Figure 3: Images from camera and corresponding occupancy grid (Click on image to enlarge). Figure 4: Example of wayfinding prompts issued by intelligent system to cognitively-impaired driver during navigation task (Click on image to enlarge). IATSL is a member of the CANWHEEL team. 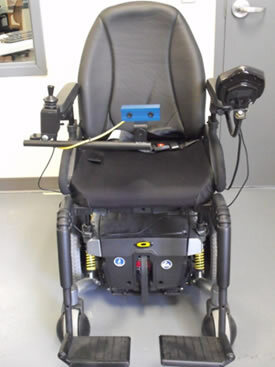 CANWHEEL is a CIHR-funded research program aimed to improve the mobility of older adult wheelchair users by enabling power wheelchair use in those who are normally excluded from use of these devices. L. G. Pawlson, M. Goodwin, and K. Keith, “Wheelchair use by ambulatory nursing home residents,” Journal of American Geriatrics Society, vol. 34, pp. 860-864, 1986. M. C. Nevitt, S. R. Cummings, S. Kidd et al., “Risk factors for recurrent nonsyncopal falls,” Journal of American Medical Association, vol. 261, pp. 2663–2668, 1989. P. Viswanathan, J. Little, A. Mackworth, A. Mihailidis, "Navigation and Obstacle Avoidance Help (NOAH) for Older Adults with Cognitive Impairment: A Pilot Study," in Proceedings of ACM SIGACCESS Conference on Computers and Accessibility (ASSETS), Dundee, Scotland, 2011. P. Viswanathan, J. J. Little, A. K. Mackworth, and A. Mihailidis. "An Intelligent Powered Wheelchair for Users with Dementia: Case Studies with NOAH (Navigation and Obstacle Avoidance Help)", in AAAI Fall Symposium on AI for Gerontechnology, Arlington, Virginia, 2012. P. Viswanathan, J. J. Little, A. K. Mackworth, T. –V. How, R. H. Wang, and A. Mihailidis. Intelligent Wheelchairs for Cognitively-Impaired Older Adults in Long-Term Care: A Review, RESNA 2013 Annual Conference, Bellevue, Washington, 2013. P. Viswanathan, J. J. Little, A. K. Mackworth, and A. Mihailidis. "Evaluation of the Navigation and Obstacle Avoidance Help (NOAH) system for Wheelchair Users with Cognitive Impairment" (Abstract), Alzheimer’s Association International Conference (AAIC), Vancouver, BC, 2012. P. Viswanathan, J. Little, A. Mackworth, A. Mihailidis, "Adaptive Navigation Assistance for Visually-Impaired Wheelchair Users," in IROS Workshop on New and Emerging Technologies in Assistive Robotics, San Francisco, California, 2011. Wang, R. H., Mihailidis, A., Dutta, T. and Fernie, G. R. (2011). Usability testing of a multimodal feedback interface on a simulated collision-avoidance power wheelchair for long-term care home residents with cognitive impairments. Journal of Rehabilitation Research and Development. How, T., Wang, R. and Mihailidis, A. (2011). Clinical Evaluation of the Intelligent Wheelchair System. Festival of Intl Conf on Caregiving, Disability, Aging and Technology (FICCDAT), Toronto, Canada, June 5-8. Winner of Rehabilitation Engineering and Assistive Technology Society of North America (RESNA) Student Scientific Paper Competition. P. Viswanathan, J. Boger, J. Hoey, A. Mihailidis, "A Comparison of Stereovision and Infrared as Sensors for an Anti-Collision Powered Wheelchair for Older Adults with Cognitive Impairments", Technology and Aging - Selected Papers from the 2007 International Conference on Technology and Aging, A. Mihailidis, J. Boger, H. Kautz, L. Normie, eds., Vol. 21, pp 165-172, Assistive Technology Research Series, IOS Press, 2008. Mihailidis, A., Elinas, P., Boger, J. and Hoey, J. (2007). An Intelligent Powered Wheelchair to Enable Mobility of Cognitively Impaired Older Adults: An Anti-Collision System. IEEE Transactions on Neural Systems & Rehabilitation Engineering, 15(1), 136-143. Viswanathan, P., Boger, J., Hoey, J., Elinas, P. and Mihailidis, A. (2007). The Future of Wheelchairs: Intelligent Collision Avoidance and Navigation Assistance. Geriatrics and Aging Magazine, 10(4), 253–256.